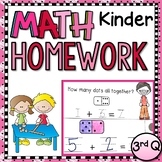 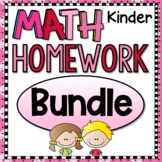 This Kindergarten Math Homework - Kindergarten - WHOLE YEAR is a great weekly homework packet that will review all common core strands on a weekly basis. 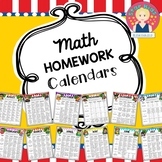 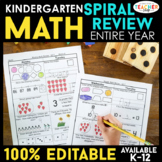 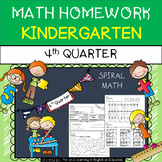 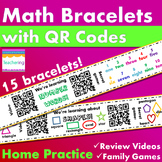 It's great for spiral review, too:)It is very kid-friendly, easy to read, examples are given for most problems, and it's packed with real work..
Kindergarten Math Homework is math homework that is completely aligned with the Common Core Standards. The homework is designed to be given once a week. 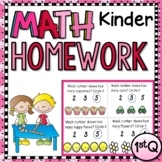 Included in this quarter are assignments about: Position and Location, Numbers Zero to Five, 2D Shapes, Addition and Subtraction, and Sorting. 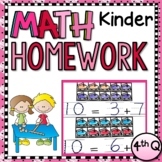 I have created a once a week math assignment that incorporates the common core standards for Kindergarten in a simple practice format. 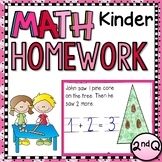 This could be used for centers too!